From a “Big 4” and MNC background, with consistent track record contributing to corporations’ profitability through skillful financial modeling, operational skills and in-depth tax and local knowledge. Total 26 years finance experience; 17 years in PRC and Asia with manufacturing-based MNCs, 14 years in Finance Director/ CFO role. Financial modeling, implementation of internal control systems, MRPII/ERP systems (incl. SAP). Hands-on knowledge and experience on IPO, M&A and tax planning(PRC + global).Achieved results through knowledge, logical thinking & creativeness. Deep Western and Chinese cultures 16+ years/ region. China Sunergy (Nasdaq: CSUN) manufactures and delivers high performance solar cell and module products to the industry with headquarter and manufacturing plants in China. Global taxation planning which result in immediate corrective measures, and immediate and long range plans. Credit management during a critical time (measures incl. credit reports, rating systems, debt factoring etc). Handle tough/sensitive issues, managing relationship with PRC partner, Government officials at national and provincial level, Power Grid Company, coal merchants etc. Substantially improved reporting and budgetary control. Instrumental in the company’s setting up of performance related pay and provident fund. The JV Co.’s dispatch hours (a measure of sales) was the top compared with similar plants in 2008 & 2009. The JV Co. has received the highest level of government subsidies compared with similar plants in 2008 & 2009. Managing a cash tight situation, raising RMB373mil new loan facilities in 2008, RMB200mil in 2009. Recruited by the CEO/Owner of a major sportswear brand, a household name in New Zealand and a leader in its own niche category.Sponsor of 13-14 National teams, World Champions and Olympic Gold medalists. Taking on the General Manager’s role reporting to the CEO. Duties covering Product development, Marketing, Wholesales and Retails operations plus HR & Administration. Help to set up business systems in the company and in its UK and New Zealand subsidiaries. Managed an extremely tight cash situation and complex logistics. Financing, import quotas, shipping arrangements etc plus a lot of customer relationship. Chief Internal Auditor(Feb’05 – Oct’05) for the Asia operation of a Japanese logistic company with Asia HQ in Hong Kong. (Globally US$ 5 Bn., Asia US$ 50 mil. )This was a temporary position referred by PicewaterhouseCoopers. Conducted a thorough internal investigation, resolved critical issues and managed a difficult audit. Completely redrafted the internal audit departments’ policy and procedures. Reviewed general IT controls, resulting in corrections of significant risks. Completed strategic review and outlined a vehicle and vehicle cost control framework for detail implementation. Responsible for Finance, Costing, Administration and Human Resources, covering China, Thailand and Vietnam.Report to General Manager Asia locally and Senior Director of Finance in USA.In charge of the KPI reporting for Asia Footwear.Reason for leaving: the position was localized. Significantly improved Costing and Finance systems, local compliance, systemically strengthen financial profitability of group operations in region through effective financial modeling. 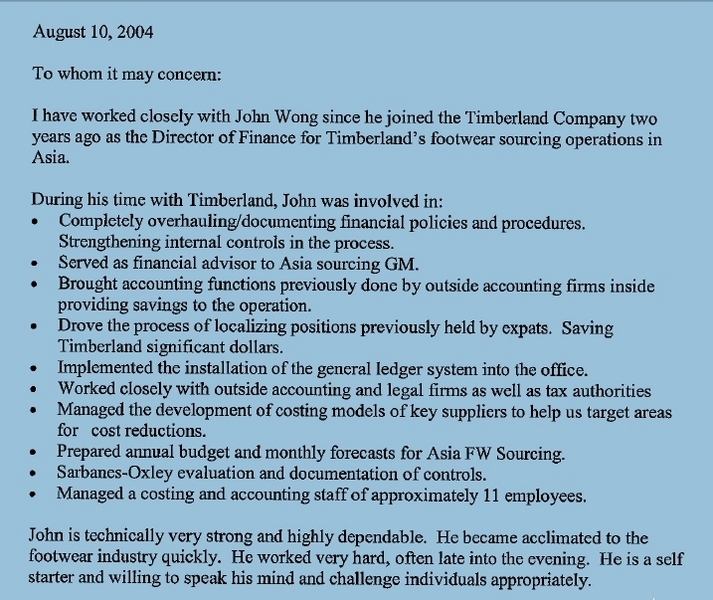 ·Built financial models and designed strategies for Finance, Costing and HR for 2002 through 2004. ·Redesigned new set of Costing procedures. ·Realized 20% saving on 2003 budget expenditure, with similar projected savings in 2004. ·Consolidated finance, payroll and tax filing responsibilities from head office and professional firms. ·Successfully negotiated reduction in PRC taxation, contributing increased profitability to group operation. ·Set up internal controls for China, Vietnam and Thailand operations. ·Reviewed tax and legal compliance for the region and cleaned up backlog on tax and social compliance. ·Led labor, overhead and factories improvement projects. Responsible for Finance, MIS, Debt collection, HR and Admin functions.During the critical period of the company co-run the company with a VP from France and re-built the whole management team and achieve a business turnaround while clearing up a lot of historical issues. 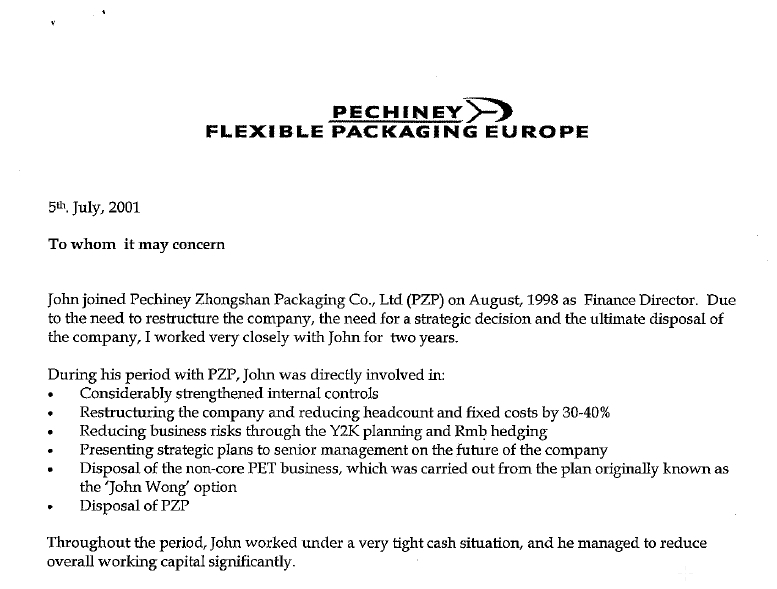 Reason for title change and reason for leaving: Pechiney had sold the company to AMCOR and the balance of the consideration was dependent on the debt recovery which took roughly 2 years to clear up. ·Set up MIS department and computerized sales, purchasing, inventory and accounting systems. ·Participated and led the financial aspects of the sale of 2 businesses (M&A), structuring the final settlement. ·JV negotiation – Due diligence in Jiangsu, East China(M&A experience). ·Negotiation with PRC tax authority on VAT issues.Debt collection and litigation support in China. ·Due diligence on an acquired A-Share Group. (Property development industry)(Apr’ 2002)(Post M&A). ·Oil and Gas project, South China – Developed a business plan accepted by VC Fund manager. (M&A role). Reason for leaving: Liquidation of the JV company. 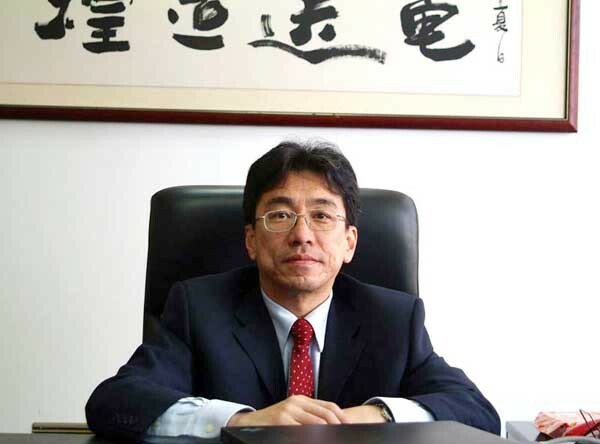 ·Achieved Rmb 4.5 mil profit improvement on revised budget in FY97. ·Restructured promotion scheme and substantially reduced VAT in the process. ·Improved control on spare parts, fixed assets, expenses and MIS procedures. ·Planned a new and effective China sales team with significant reduction in costs and manpower. (over 40%). ·Successfully managed the spending of the China Sales Operation to below-budget spending. 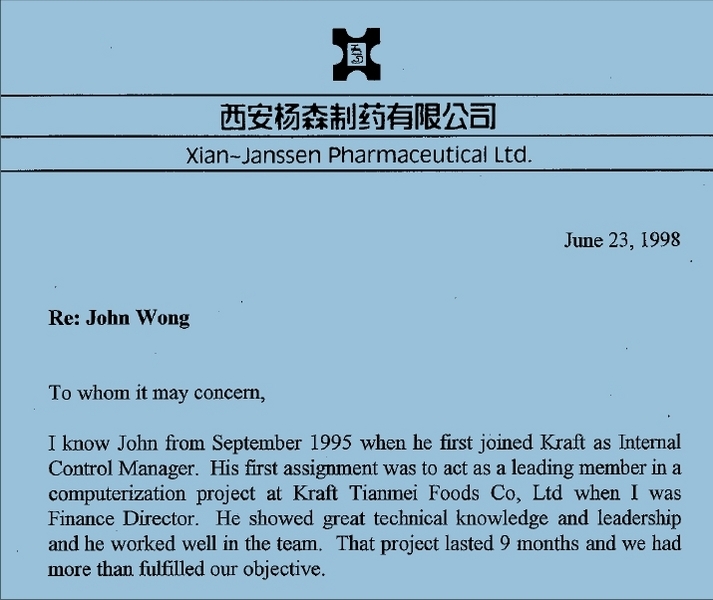 Responsible for 4 PRC joint ventures (JVs) and import/trading activities in Greater China. ·Implemented a sales/manufacturing/finance computerized systems for the 4 JVs in China.Co-leader of large scale (multi million) ERP implementation project. Re-engineered the JV’s management and internal controls. ·Planned and implemented a PRC-wide distribution network with other major Brands and the JV logistics provider. ·Oversee 2 expansion projects (construction of new factories/ relocation) in South China. ·Reviewed down-sizing/process re-engineering of the Taiwan import operation. Audits, IPO listing (incl. PRC), due diligence, technical reviews, PRC consulting on legal and taxation, liaise with lawyer. Achieved a very high profile and high exposure role within PwC as the key China Technical person. ·Audited cross-border manufacturing operations in a diverse range of industries. 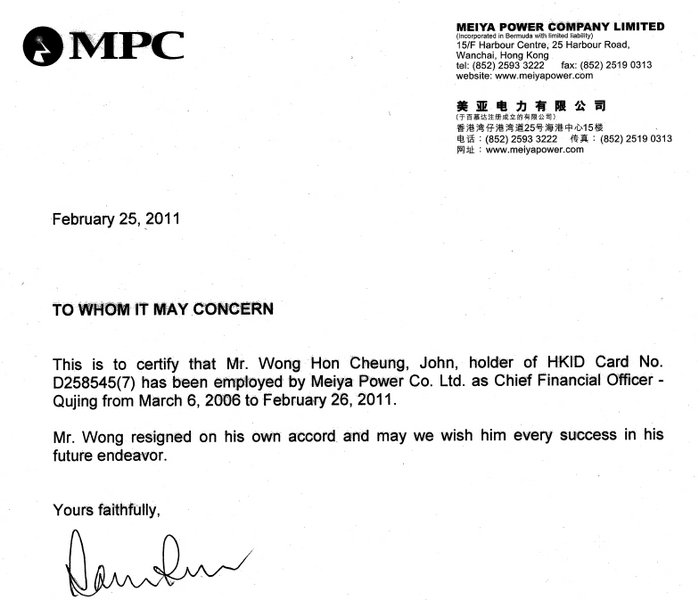 ·Performed a major planning/budgeting/restructure exercise as well as a guiding role for an IPO listing in the HKSE. ·Other high profile roles: technical panels of ‘H’ and ‘A’ shares IPO; HKSA review of published accounts etc.